Friends Will (Simon Bird), Simon (Joe Thomas) and Neil (Blake Harrison) get an email from their old friend Jay (James Buckley), telling them how he is a big shot in Australia and that they should go over and visit him. Spontaneously, the three guys fly over to Oz and find that Jay in fact only works in the toilets of a club, and lives in a tent in his Uncle's garden. Whilst there, Will bumps into Katie, an old friend of his, and they seem to have an instant connection. With Will's holiday plans clashing with the ideas of the other boys', it seems to be veering further and further from the travelling trip they originally envisioned. Based on hit TV series The Inbetweeners, this film's predecessor was a smash at the British box office, breaking records for the highest opening gross for a UK comedy. Serving as a "farewell" to four characters loved by most of the nation, the original Inbetweeners Movie worked well as a light hearted comedy, but lacked that innovation that made the series such a hit. It was undeniably successful, but possibly at the expense of its own quality. The humour was there, and the ending was nicely poignant, but something was missing. 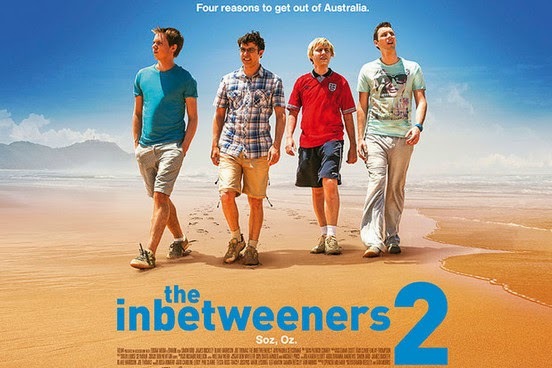 The Inbetweeners 2 was promoted as a sequel that improved upon the original, but I'm not entirely sure it does. In fact, it's about as neck and neck as possible. Much like the original, it isn't quite as funny as it should be, it suffers from originality issues and gives in to far too many cliches. But, similarly like the first one, it's also brilliant fun. The Inbetweeners has always had a unique style of comedy that hasn't really been copied by anything else. Perhaps this is due to the success of the show resulting in other producers not quite feeling they could reflect it to the same level, or perhaps it's because it just isn't a very good comedic style in the first place. The franchise certainly has its critics (myself not one of them), but I personally believe it to be a combination of both possibilities. These characters have been so brilliantly written from the offset, it would seem strange to have characters from another show deliver similar dialogue. That being said, The Inbetweeners has always suffered from repetition. There's only so many times watching someone projectile vomit can be funny. Yet, The Inbetweeners 2 manages to be funny throughout. It might not be as rounded and consistent as its predecessor, but when it tries hard, it brings out moments that are so hysterically funny you'd be hard-pressed to find anything funnier in cinemas all year. Will's campfire rendition of The First Time I Ever Saw Your Face and a particularly eventful water ride spring to mind. The Inbetweeners has also been consistently impressive at keeping its characters strict to their cores. Rarely in the TV series did a character do anything that didn't quite feel right, and normally this doesn't transfer well in TV-to-movie adaptations. Which is what makes it so refreshing that not only have writers/directors Damon Beesley and Iain Morris done this once, but twice. Will's brilliant sense of sarcasm is as strong as it was back in series one, Simon still suffers from girl issues and copes with them in typically funny ways and Neil remains as dopey as ever. But this film's heart still lies with Jay, a character so nicely developed over the three seasons and two films that you almost wouldn't believe he comes from a Channel 4 comedy. Here he is given more depth than ever, with more motives for his constant lies and exaggeration than we've been given before. He may be the rudest and most vulgar member of this franchise, but at the same time, he's the most vulnerable, and those aren't easy traits to combine well. But, where this film suffers (much like the original), is in its originality. Most of the jokes feel like they've been taken straight out of episodes of the original show and re-worded slightly. That isn't to say the film isn't funny, it just doesn't feel as funny as it should be. And whilst the writers have done a fantastic job at writing these characters so consistently over the years this series has been around, surely it's about time they learn how to write female characters. Almost every girl in this film, and the original, acts merely as a sexual object for the more frequent male characters. Originally this came across as a smart commentary on today's society and gender issues that are commonly raised in schools, but these characters are at Uni now. It's starting to feel a little tired. Also, a holiday again? Really? I mean, Malia was just about believable last time round, but trying to believe that these kids (two of which are at Uni, the other works in a bank) can spontaneously afford a trip to Australia is a bit of a stretch. But, for the most part, The Inbetweeners 2 works. The series isn't faultless, and the films are considerably weaker than their TV counterparts, but this is still a franchise worth investing time in if you haven't yet. The film and the TV series' are brilliantly entertaining, but this feels like a good time to stop. The characters have all moved on with their lives, and whilst it lacks that poignancy the original film brought in its final act, this still feels like an ending. It may suffer from originality issues, and the plausibility of its writing and female characters may feel a little overdone, but this is still a light-hearted comedy with enough humour to carry us through its lean 96 minute run-time. This franchise has been an absolute blast, but it's time to say goodbye, and this feels like as good a time as ever. To Summarise: Frequently funny and entertaining if occasionally repetitive and patronising, The Inbetweeners 2 is a solid "farewell" to some of British TVs most loved characters.